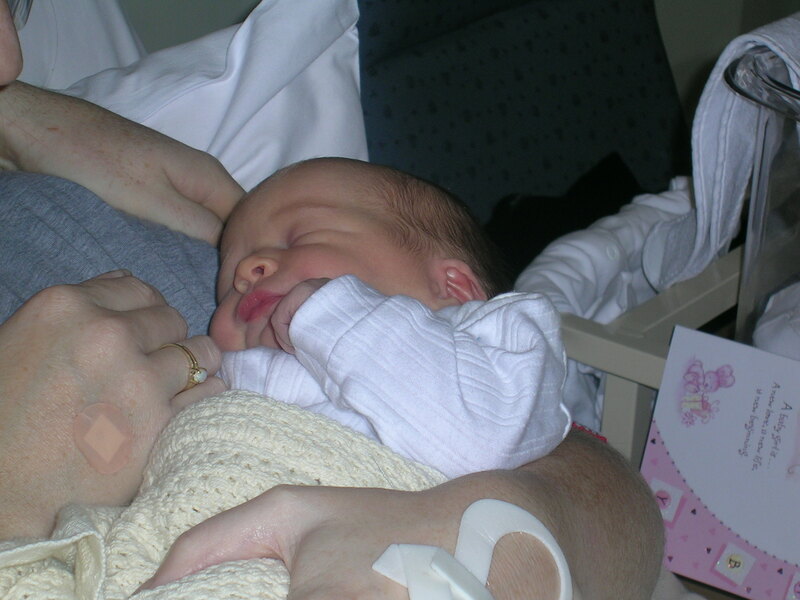 Home Pregnancy and Birth C-section My birth stories – Number 1- the mischievous breech one! My birth stories – Number 1- the mischievous breech one! I’ve read a lot of birth stories. Most recently on the new Irish website www.42weeks.ie designed to promote positive birth in Ireland. It got me thinking of my own births. All so different, yet almost identical! Not least all by c-section. I realise I haven’t shared my own birth stores on my site so here goes! Baby 1…..
My first pregnancy went well. Baby was breech around the 28 week mark but no one was concerned at that point. At about 32 weeks my consultant advised that if she remained breech a section would be advised but before we even went down that road he could attempt an External Cephalic Version (ECV) to try and turn her. Of course all this was hypothetical until, at 36 weeks she was still breech. I agreed to try ECV. I attended the breech clinic and as I sat in the waiting room felt massive movement from baby. I went in for the procedure, they scanned me and she was head down. Yippee – back on track. I think she realised what was coming and hurried into position in the waiting room. I was told it was highly unlikely at this stage I would have any further issues with her breech position. Roll on to 39 weeks and I went for my last antenatal appointment before my Christmas Day d-day! It was 22nd December 2006. A Friday. Everyone was in great spirits preparing for Christmas weekend. I had been told I would have a sweep of the membranes but before they commenced they would check baby with a quick scan. My heart almost dropped as the sonographer asked had I felt baby move recently. Of course I assumed the worst. She quickly reassured me that baby was alive and kicking – just doing it the wrong way around – at some point in the preceding week she had turned breech again! Not only that my waters seemed to have diminished to a very low level – oligohydroamnios. I asked what the course of action would be and was advised that ECV was not an option. She was wedged into my pelvis and with low fluids it could be dangerous. A section was recommended. I naively asked when and was told now! Strangely my immediate concern was my hospital bag that was sitting in my hall and my car was in a train station miles away as I had fully intended heading home after my appointment. I was told if I didn’t want a a section I could wait and see if she would turn back – although highly unlikely and I was told I would be required to attend for fetal monitoring each day. The choices were not appealing but I agreed based on my obs recommendation to get baby out! I was walked across the courtyard with my husband and brought to an ante natal ward. As we waited at the nurses station for a bed hubby looked decidedly pale. He was sent off to do the formal admissions paperwork and I was prepared for theatre with blood tests, checks, a consultation with the anaesthetist and changed into a theatre gown. By 2.45pm I was wheeled into theatre – I think they put me in the wheelchair to save my dignity – I had no dressing gown and only a theatre gown with a big gapping hole at the back! The birth went totally smoothly – albeit the experience was a little scary and strange. Along came my first little baby – a girl. Having already experienced one shock of the day with being rushed to theatre I got a second shock as I had been convinced my entire pregnancy I would have a boy! So here I was in the recovery room having stood outside the Rotunda hospital Dublin waiting for my husband and dreaming of a nice lunch post appointment, only three hours earlier. I could never have imagined as I walked in the door of the hospital at 12.30pm that I would only leave 5 days later and with a new little daughter! Great story! Congratulations for delivering a beautiful baby girl! The D-day is one of the most nerve-wracking events in a woman’s life and being brave is a must. I experienced 6 hours of labor pain. I didn’t have anyone, aside from the nurse, in the delivery room. I felt helpless that day. I’m glad you get through this. Thanks Lisa! It’s amazing what us women can cope with when we have to! Motherhood is an amazing force! Oh my congratulations. He is soo beautifull and cute 🙂 I also want 1 boy and 1 girl, but after 1 year.